We are very excited to announce the launch of Fruity Knitting, starting with the Fruity Knitting Podcast – Episode 1! We certainly hope you enjoy the podcast – we have battled wind and weather (and not a little technology) to bring it to you. Watch it to find out more. 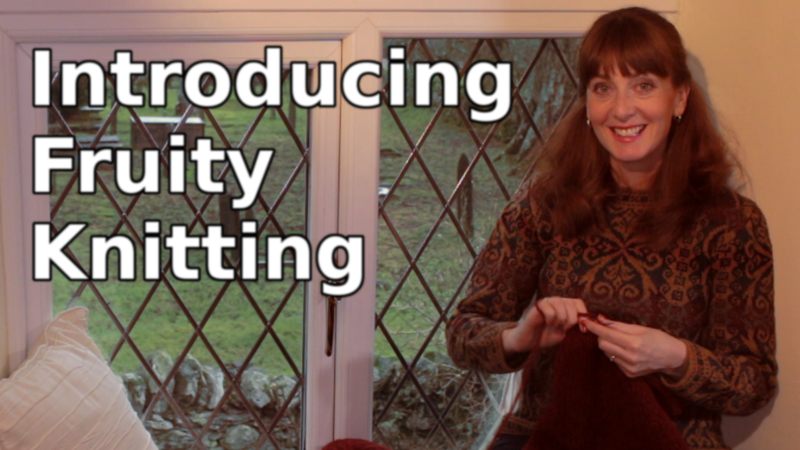 In addition to the Podcast, Andrea is already working on Fruity Knitting Technique Videos, showing you – in full technicolor – the basics – knit one, purl one – through to really extraordinary things, like, er, knitting with two hands at the same time. and there is also a Fruity Knitting Podcast Group on Ravelry. Come and say hello! Andrea is wearing the Henry VIII by Alice Starmore. Andrew is wearing the St Brigid by Alice Starmore. Yarn is Alice Starmore Hebridean 3 ply in the Colorway Selkie. Madeleine is wearing the Na Craga by … Alice Starmore. Yarn is Alice Starmore Hebridean 3 ply in the Colorway ???. Calder Beanie Pattern is available for free at Rowan, but you may need to register. Kimiko Ishizaka plays Bach’s Well-Tempered Klavier, Prelude Number 3 and Prelude and Fugue Number 5. Love your podcast.bless your family and can’t wait till next one,it was so relaxing . Our very first blog comment! Thanks, Sheree. Episode 2 is uploading as we speak, so stay tuned! Loved the podcast looking forward to the next one. Hi Barbara. Thanks for your feedback. I hope you’ve kept up with the other episodes – we just released Episode 4. Sorry we’re so slow to get back to you, but we are both busy as you can imagine. Episode 1 gave me the delightful experience of being inside on a rainy day knitting with my cat by my side and watching my first ever podcast, a knitting one! I loved this podcast! Adding your site to my regular reading list, and looking forward to watching the next episodes. So glad to have discovered this. Aside from the knitting, the setting in N. Wales drew me in. My Dad is from there, born in Anglsey so I feel very connected to the area. Try Snowdon in warmer weather for a different experience. (I now live in the US.) I found your remark about the local yarn stores to be so true. I was expecting more myself when I visit the UK and found the selection pretty dismal in small rural areas. Such a contrast with what is being produced and sold not too far away. I always regarded the UK as the heart of knitting and wool so was amazed to find it is now regarded more or less as a quaint hobby by alot of people now. There was atime when everyone was knitting there but now not so much. I am enjoying riding the wave of a resurgence of knitting here in the US. Your podcast reminded me of a knitting circle, the way you chat with us and introduce your family. I look forward to future episodes. Hi Glynis. We’re very glad you found us! One day we will do Wales in the summer, I can imagine it would be lovely, but we also somehow enjoy the cold – coming back to a warm fire, or sitting in the Alpine Cafe with a scone or a pie. We have been given one wool shop recommendation, and we’ll do some research before our next trip. There must be some good shops there, but it is probably difficult in the small towns. Enjoyed this so much! Heard about it via Mason Dixon Knitting. We were totally honored to get a mention from Mason Dixon, and we are of course pleased that it introduced the Podcast to some new viewers. As a relatively new knitter late in life, searching the web for inspiration and instruction… and an Australian…I was thoroughly charmed by your podcast (13) which I stumbled on, showcasing Australia and the Dingo Dyeworks and a fellow Ravelry member from Brogo and immediately subscribed…I loved the music episodes as well-so beautiful. Now I have just watched this first episode in Wales where my husband & I & my sister & her husband visited just last year tracing the place of our our Welsh ancestors.. Your knitting is amazing & I’m really hooked now to try to experiment with Fair Isle swatch after my current project is finished and teach myself to read charts. Hi Diana. It’s great to hear that you’ve found us. If you’re starting with Fair Isle, then you should check out Andrea’s tutorial on the Baa-ble Hat, pattern by Donna Smith. We also have an interview with Donna Smith, who was is a great advocate of Shetland knitting and was patron of the Shetland Wool Week in 2015. KNITSONIK, sometimes known as Felicity Ford, is also very inspiring for colourwork. There should be a lot for you to enjoy there!! I love to hear from viewers all around the world, but Australia is of course special for us. We will be heading back to Wales soonish. Thanks for watching and have fun with your Fair Isle. Hi Andrea and Andrew. I just love your podcast. I’m from New Zealand and have just discovered the Internet world of knitting. I am starting at episide number one after having watched your latest episode and the vintage knitting episode, which I loved as Susan Crawfords designs are some of my favorites. Thank you for sharing and keep up the wonderful and very professional podcast. Hi Suzy Lou. I can see that we’re really late in getting back to you – please forgive us, but we have been working hard! Lovely to hear from New Zealand. Renee was so impressive – jumping into the Fair Isle sweaters. We are going to record the last bit of Episode 17 tomorrow and should be releasing it Sunday or Monday. We love getting feedback so please stay in touch. Cheers, A + A. Thank you for bringing happiness into the world. The care and artistry you bring to your knitting spreads widely to all areas of life – to cooking, gardening and caring for people and our world. Hi Patricia. It is great to hear that you enjoyed our first episode, and we are honoured to receive your very first response on the net!! We are just about to release Episode 17 now – and we now feature a special guest in each Episode. Stay in touch! A + A. Just finished watching your first podcast. Indroduced to your webpage/podcast by a friend in London. Well done, such a fun and entertaining podcast. Inspirational knitting Andrea. Well done to you Andrew. Great to see another guy knitting. And another Australian no less. I live in Norway where men knitting is quite an anomaly. Great to have some male inspiration.